The Smithsonian’s National Air and Space Museum will open its newest exhibition, “A New Moon Rises: New Views from the Lunar Reconnaissance Orbiter Camera,” Feb. 26, displaying dramatic landscapes of the Moon captured by Arizona State University’s Lunar Reconnaissance Orbiter Camera (LROC) on NASA’s Lunar Reconnaissance Orbiter spacecraft. These breathtaking images showcase everything from Apollo landing sites to majestic mountains that rise out of the darkness of the lunar poles. The exhibition will be open through December 2016 at the Smithsonian in Washington, D.C.
Mark Robinson, professor and principal investigator of LROC at ASU’s School of Earth and Space Exploration, partnered with National Air and Space Museum staff members to make the exhibit possible. Robinson’s team includes undergraduate, graduate and postdoctoral students with backgrounds in science, engineering and IT. It is this combination of skill sets and talent that are needed to operate LROC’s high-resolution Narrow Angle Camera and lower-resolution Wide Angle Camera and to produce the images featured in this exhibition. “A New Moon Rises” is divided into six themes — Global Views, Exploration Sites, Discoveries, Vistas, Topography and Craters. These themes helped to determine which of the thousands of images taken by the LROC would be chosen for display. Visitors will also have the opportunity to see new images from LROC projected on a large screen. The new images will be updated daily. The exhibition includes a display of flight spares of the LROC cameras, and a large 3-D model of a young lunar crater. The 61 large prints in the exhibition reveal a celestial neighbor that is surprisingly dynamic, full of grandeur and wonder. 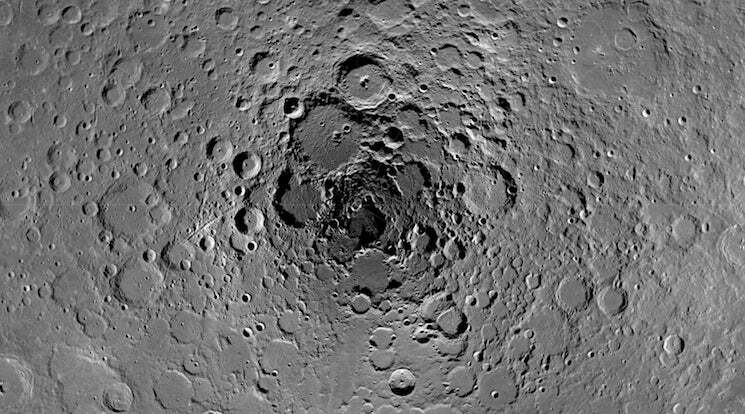 The more than a million images from LROC are reshaping our understanding of the moon. They reveal newly formed impact craters, recent volcanic activity, and a crust being fractured by the shrinking of a still cooling interior. “Most people do not realize that the moon is still a very active place, and that it has breathtaking landscapes that are both familiar and alien. All of this is evident from the images LROC has taken and that are displayed in this exhibition,” said Tom Watters, senior scientist at the Smithsonian’s Center for Earth and Planetary Studies and curator of the exhibition. NASA launched the Lunar Reconnaissance Orbiter in 2009, and the mission is managed by NASA’s Goddard Space Flight Center. Part of its primary mission was to help prepare NASA to send astronauts back to the Moon. Its other mission is scientific research, exploring our nearest celestial neighbor in ways never before possible. The exhibition is made possible by the support of NASA and Arizona State University. The National Air and Space Museum building on the National Mall in Washington, D.C., is at Sixth Street and Independence Avenue S.W. The museum’s research, collections, exhibitions and programs focus on aeronautical history, space history and planetary studies. The building is open from 10 a.m. until 5:30 p.m. every day (closed Dec. 25).